BIG W is home to a huge range of Australia’s favourite brands, including Apple, Bonds, Peter Morrissey and Mambo. BIG W is committed to giving Australians the lowest prices every day. 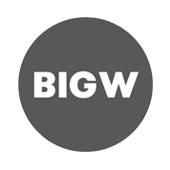 BIG W also stock a range of house brands including, Smart Value, AWA, Dymples and of course Emerson and Avella the on trend fashion brands at great everyday low prices.